A couple of weeks back I was invited down to Nourish in Sheffield City Centre to find out more about how they are enticing more people to eat healthier snacks and lunches. 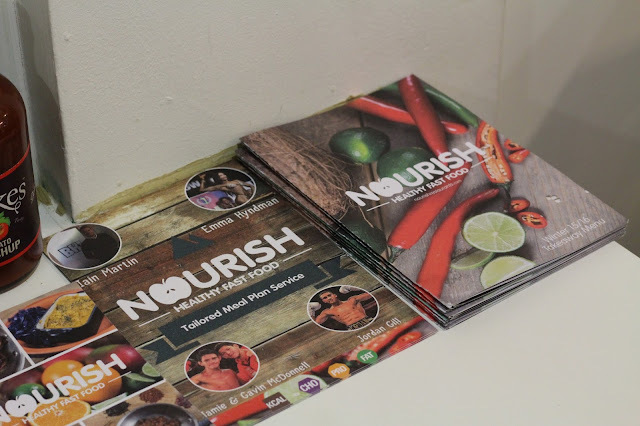 I've noticed Nourish on the high street in Sheffield but haven't ever been in before to see what they have on offer,so it was a great opportunity to learn more about their concept and recipes. Nourish first opened it's doors to us Sheffield folk back in 2013 and they more recently opened another store in Leeds city centre. 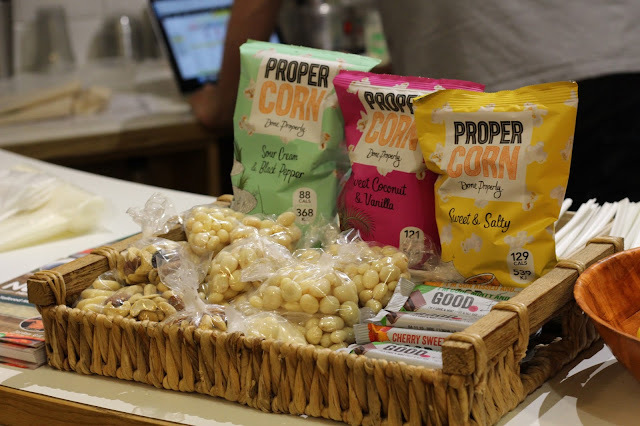 Their ethos is to make healthy but tasty snacks and meals that don't break the bank whilst providing all the nutritional goodness other 'fast food' places lack. David Stache owns both Nourish stores and is heavily involved in the development of each dish and drink served to his customers. He's actually a nutritionist by trade so his knowledge of how to infuse healthy essentials into diets is second to none. We got to have a Q&A session with him on the evening of the event and you can totally tell he is so invested in trying to help people improve their diets whilst still being realistic and allowing for hungover days when a salad just won't cut it! Before I go on to talk about the delights we got to sample, I need to point out that at the moment due to pregnancy I am VERY picky with my food so some of the dishes didn't take my fancy, but so that you get a more 'normal' view heres a link to my buddy Tarnya's blog post on the event. 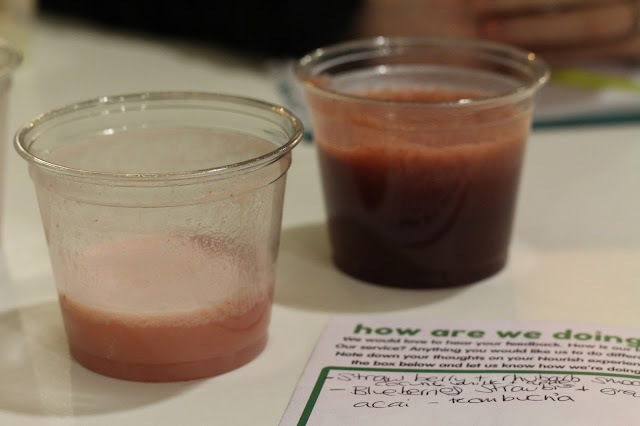 First up we sampled some Nourish smoothies- Strawberry and Rhubarb pie is the lighter coloured one of the two shown above and my personal fave. I found it refreshing and sweet whilst not being overly thick and sickly like some of the shop bought smoothies I've tried in the past. The darker is the Berry Kombucha smoothie that contains Blueberries, Acai, Grape,Strawberry and Kombucha. I had a few sips before googling whether its safe for pregnancy and quickly found a lot of conflicting information so decided to skip this one. I know Tanya loved this one though so don't let me put you off trying it! These smoothies are both £3.45 for a full size serving and a great way to start off your healthy day. 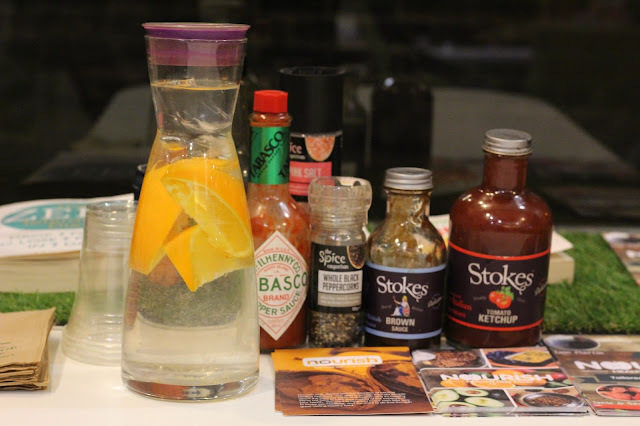 Once we'd supped on our smoothies and orange infused water (which was very tasty btw) we were then treated to little sample pots of some of the dishes from the main menu. 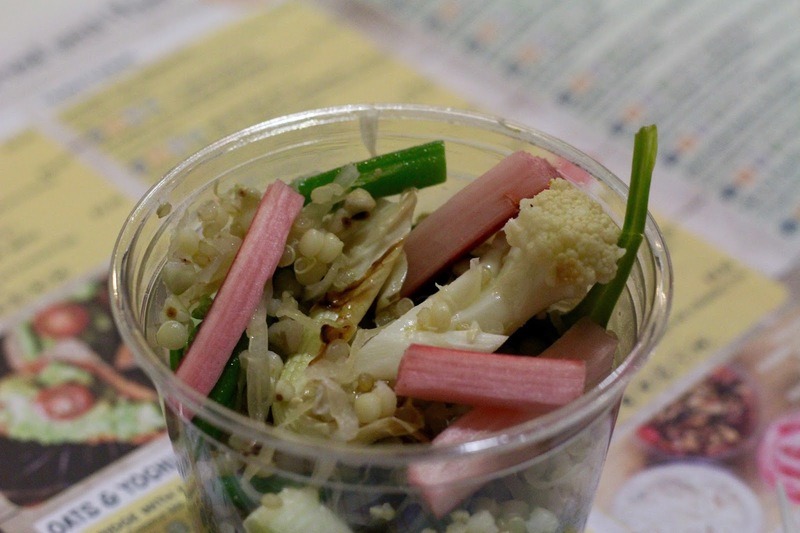 This one is the Spring Superfood and contains grains, green beans, sauerkraut, roasted cauliflower, rhubarb and spring onions. I enjoyed this little pot of goodness, apart from the sauerkraut.. its an acquired taste I believe and not something I'd rush to have again! Remove that though and this salad is a beaut combination of textures and flavours. What stood out to me most was the rhubarb; the sweetness really worked with the green beans and grains. A full size portion of this salad is £4.45 or you can add salmon to it for an extra 50p. 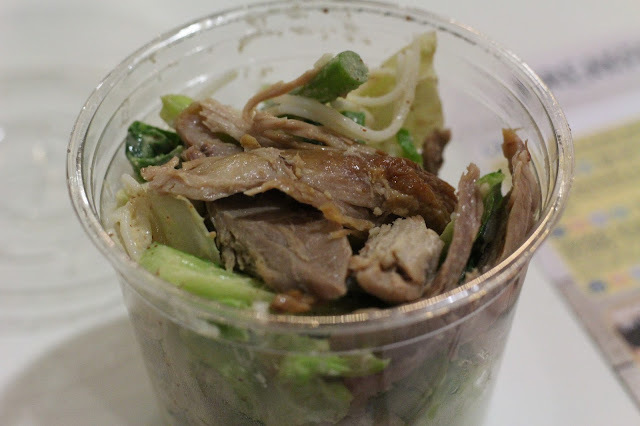 Next up was the the Duck Bang Bang Salad- a rice noodle salad packed with duck, green beans, Bok Choy (Chinese cabbage) topped with an almond ginger dressing. The last hot dish sampler I tried was the Italian turkey meatballs- turkey mince with tarragon, parmesan, tomato and lemon topped with spirals of carrot and courgette. These were, by far, my most loved hot dish of the evening. I found the meatballs really light in comparison to beef or pork ones you get in most Italian dishes. It's £5.95 for the meatballs and they are sure to keep you full up for the rest of the day! Just incase though, you can make these into a meal deal by adding on a bag of Propercorn and a bottle of water for an extra £1.50. Nourish also stock some tasty snacks you might like to stock up on for those moments in the day when you need something to nibble on. My go to nibble at the moment is salted popcorn! The evening of mini healthy treats finished off with a rather yummy salad called Lift Yourself. This salad is made up of salad leaves, beetroot spirals, feta cheese, edamame beans, grains and segments of orange and lime. I really enjoyed this refreshing salad and loved the combination of the feta with the sweeter flavours. 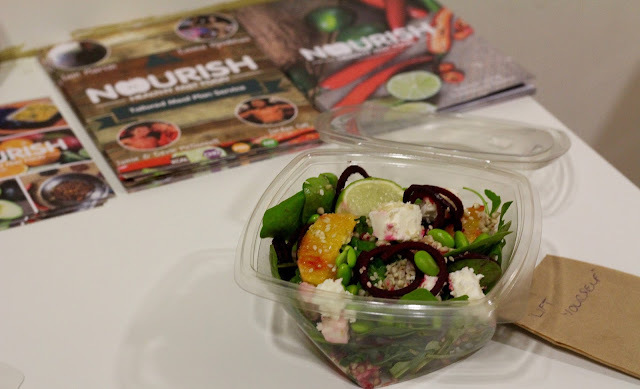 This salad costs £4.75 and I highly recommend you try it out when you visit Nourish. 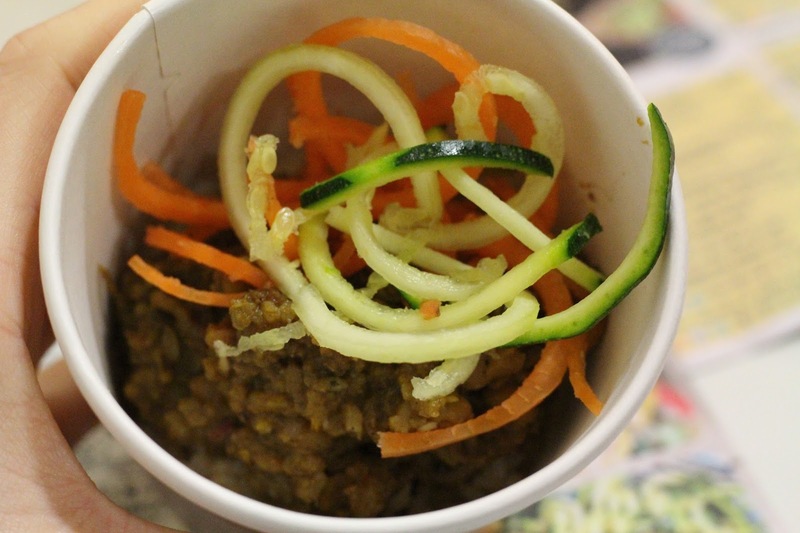 Overall, I really enjoyed discovering Nourish and their new menu. Eating the type of food they serve would take a bit of getting used to for me, mainly because I like a good dollop of dressing on my salads but I can totally see the appeal it will have to healthy eating people. I'd love to be one of those right now, and being pregnant means I should be eating lots of goodness but the food aversions are still in full swing. I've got a voucher for a free pud at Nourish.. I might pop in tomorrow to pick that up actually. The dairy free blueberry cheesecake sounds yum! 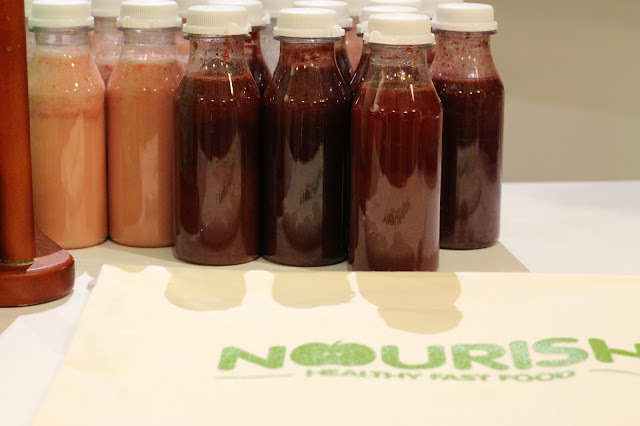 Have you tried Nourish yet?